Searching for Bonobo in Congo » Congo Tourism. Focus on Lac Ndjale. What could be more appealing? It is in the heart of Africa where forest meets savanna. Its northern shore is forest, its southern shore savanna. 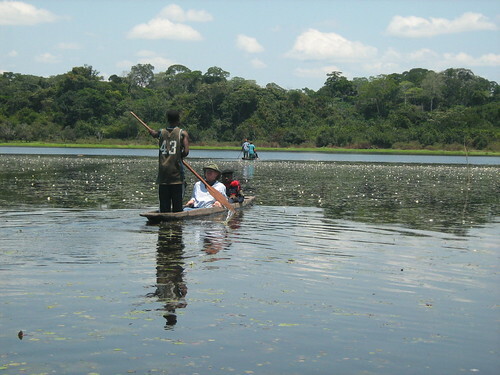 Fifteen kilometers long and not a single roaring motorboat; in fact there are not even any row-boats on Lake Ndjale, but plenty of dugouts. You can rent one for a dollar, with or without pinancier (oar man). That is what John thought, too. So he took off from Kindu by motorbike, the only feasible transport given the condition of the bridges. They made a caravan: John, with the Provincial Minister of the Environment, followed by her entourage of security persons and advisors. Getting there was a bit onerous, but once there it was idyllic. Here, one of several savanna islands they passed through. John in a dugout on Lac Ndjale. He assured me that it was far more peaceful than gondolas on the dirty (and flooded) canals of Venice. 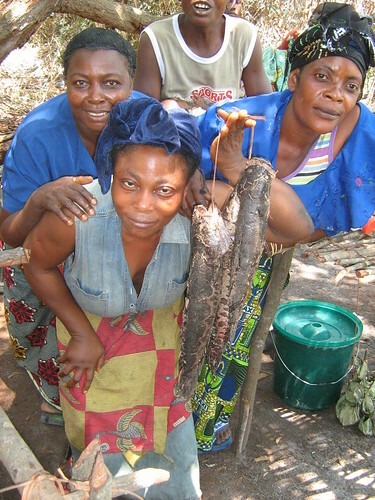 Fresh fish with no hint of industrial pollution are offered by the local fisher women. 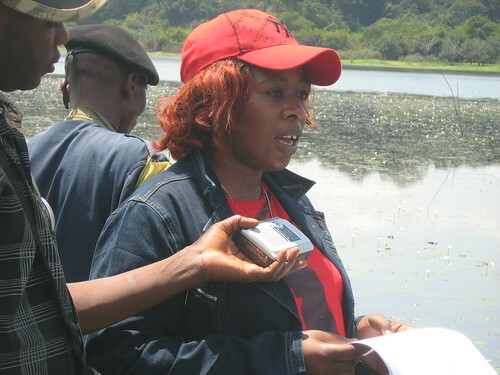 The Minister of the Environment addressed the villagers when back on shore. The lake has tourist potential, she is convinced, although after her own tipsy outing she suggests larger dugouts for tourists. – I want to visit Lac Ndjale, you tell him. – In Africa, you add helpfully. – In Congo, the Democratic Republic of Congo, you complete the clue. – I think I should go in through Goma. It’s not too far away, you suggest tentatively. – Yes, probably. He is thinking that Goma must be the capital [the cursor is slipping around , Goma, BBC, …] He is doing a little quick skimming. Pause. – We are not yet arranging trips to Lac Ndjale, he is emphatic. – but certainly a very interesting idea, he is doubtful. This is just the beginning. 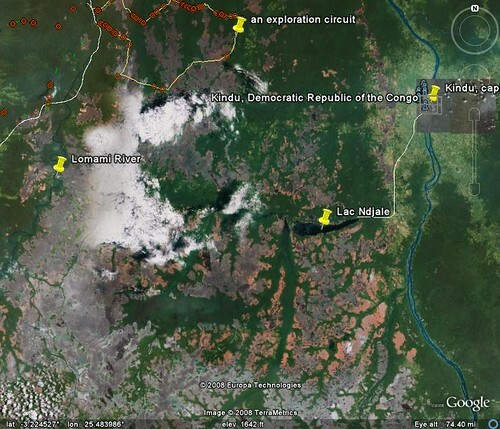 There is a lot more tourist potential in this TL2 landscape, between Congo’s forest rivers. I hope to write about it all. 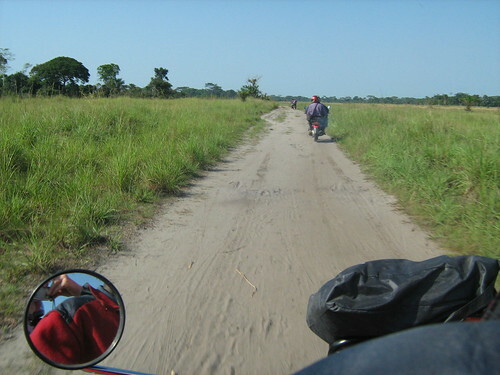 The little white line between Kindu (capital of Maniema Province) and Lac Ndjale is the motorbike-worthy path. About 40 km. This entry was written by Terese Hart, posted on 2008-10-08 at 8:58 am, filed under Guides and how to. Bookmark the permalink. Follow any comments here with the RSS feed for this post. Post a comment or leave a trackback: Trackback URL. Don’t most places that are suddenly exposed to mainstream tourists end up under heavy damage? That’s a double standard I hold, to have unlimited freedom to roam these places as I want, but somehow deny the others. Tourism to the “off the beaten track” places takes a lot more work (most places in Congo) and there will undoubtedly be lots of frustrating logistics— but too many other tourists will NOT be the problem in DR Congo. Not now. Do you have any books for purchase? I have written a manuscript of a book that is our time in Congo up to the beginning of the war in 1996. It is mainly in the Ituri Forest. I need to reread, edit and find a publisher! do you currently recommend the TL2 area for travel? How deep is Lake Ndjale?